Growing tomatoes has always been accepted by many of my like-mined vegetable growing colleagues as a way of staying healthy through activity. 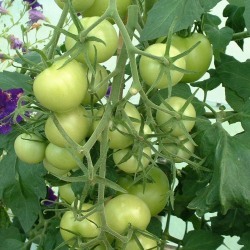 We have also been aware that growing tomatoes and other vegetables is the healthiest way to feed our bodies. The content of such fresh food is not only going to have maximum taste but also contain maximum nutrients. I came across this interesting and informative article in the Daily Mail recently. Written by Fiona Maccrae - Science Reporter. It is reproduced below with my sub headings, photos and comments in brackets. At this rate, scientists will have to come up with a better description for the tomato than mere 'superfood'. While it has long been credited with cutting cholesterol and preventing some cancers, the fruit now appears to have two more health-giving benefits. Protection against sunburn and helping keep the skin looking youthful are the latest pluses, a study has found. 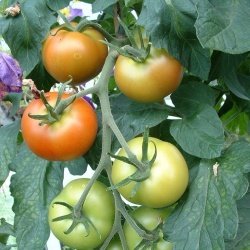 Professor Mark Birch-Machin said growing tomatoes could provide a cheap and easy way of improving health. "I went into the study as a sceptic," he added. "But I was quite surprised with the significance of the findings." Researchers at Manchester and Newcastle universities recommend two tomato-based meals a day for optimum health. Possible menus include a glass of tomato juice with breakfast and a salad later or tomato soup for lunch and pasta with a tomato sauce for dinner. To test the fruit's ability to protect the skin, ten volunteers were asked to eat five tablespoons of tomato paste mixed with olive oil every day for three months. Another ten had a daily dose of olive oil - minus the tomato paste. Tests using ultra-violet lamps showed the tomato-eaters were a third better protected against sunburn at the end of the study than at the start, the British Society for Investigative Dermatology's annual conference heard. Other tests suggested the tomato-based diet had boosted production of collagen, the protein that keeps skin supple. If that were not enough, the fruit also protects our mitochondria - the elements of cells which turn the food we eat into energy. Professor Birch-Machin, of Newcastle University, said: "Being kind to our mitochondria is likely to contribute to improved skin health, which in turn may have an anti-ageing effect." The researchers stressed, however, that their findings were not an excuse to throw away the suncream. Professor Lesley Rhodes, a Manchester University dermatologist, said: "People should not think tomatoes in any way can replace suncreams but they may be a good additive. "If you can improve your protection through your diet then over several years this may have a significant effect." She added: "These weren't huge amounts we were feeding the group. It was the sort of quantity you could easily manage by eating a lot of tomato-based meals." The fruit's benefits are credited to lycopene, the pigment behind its distinctive red skin. Lycopene, a powerful antioxidant capable of mopping up free radicals - the harmful molecules linked to cancer - is made easier for the body to absorb when tomatoes are cooked or processed.